As part of Cook Islands language week we are highlighting artefacts from the Cook Islands collections. 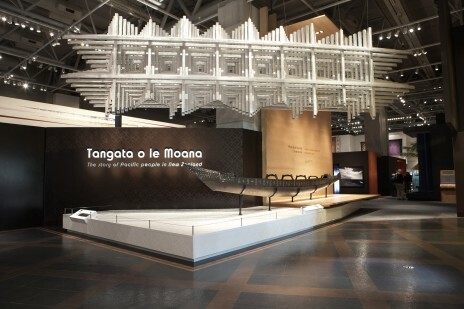 One of the treasures we look after here at Te Papa is a stunning canoe that appears at the entrance of the exhibition Tangata o le Moana: the story of Pacific people and New Zealand on level four. This vaka (outrigger canoe) is from Manihiki in the northern Cook Islands and is one of only three such vaka that survive in museums worldwide. It is called Tauhunu after the main village on Manihiki. Originally, Tauhunu would have had an outrigger for stability. It would have been paddled mostly, but it could also have been sailed, mainly inside the lagoon. Removing the outrigger would have allowed it to be used as part of a double canoe. Here are models of what an outrigger canoe and double canoe would have looked like. Tauhunu is made from wood lashed together with sennit (coconut husk fibre) and is decorated with inlaid pieces of pearl shell. Canoe building continued on Manihiki until recently, but modern vaka do not match the quality of workmanship of Tauhunu. Tauhunu was displayed at the New Zealand International Exhibition of Arts and Industries, held in Christchurch in 1906. It was sent there by Lieutenant-Colonel Gudgeon, a New Zealander who was Resident Commissioner in the Cook Islands at the time. It was bought for the DominionMuseum, Te Papa’s predecessor, in 1907. Unfortunately, nothing more is known about the history or makers of Tauhunu. In 2006, the Manihiki community celebrated the hundredth anniversary of the arrival of Tauhunu in New Zealand. They presented Te Papa with the gift of a pearl necklace to mark the occasion. The event renewed the connection between the people of Manihiki and their rare cultural treasure. In regards to the vaka, Tauhunu. Is the vaka still on display? If not, where can I view it? I believe I know the boat builder but would like to see the vaka to verify the markings. this is a great surprise, I was just searching for such a model. Could you please help me with the accession no. of the te papa? Hope you and the family are well, here it is incredibly hot. A lot of people admire your books on samoan culture. Are you planning to come to Vancouver?